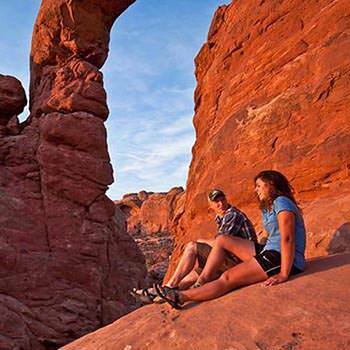 "Arches sunset National Park tours"
The Arches Sunset Tour was a fantastic experience, it couldn't have been better! Stewart was a great guide. he was very knowledgeable about the geology, plant life, and native ancestors that lived in the area. He also hit all the highlights of Arches National Park. We thoroughly enjoyed his commentary and the "snack break" at the end of the tour! Chris, our driver was very informative on the tour. The scenery was unbelievable. There is no way to describe this trip to anyone, they have to experience it themselves. Arches National Park is spectacular! I have been a lot of places, but this is definitely one of the most exciting trips we have ever taken! So glad we took the Arches Sunset Bus Tour. Stewart was our guide and he is very knowledgeable and interesting to travel with. The park was more alive with his comments, stories and tour. We highly recommend the bus trip for anyone who likes to "learn" about the park rather than just view it. We are coming back for one of your River Trips.